ONAWAY, MI – A study now underway to determine the status of young sturgeon in Black Lake is expected to shed light on the success of the state stocking program there. Approximately 1,100 mature sturgeons are thought to swim in the Cheboygan County waters, but less is known about the younger ones that have been stocked there. “There is a black hole in our knowledge,” said Dave Borgeson, the Northern Lake Huron Unit supervisor for the Michigan Department of Natural Resources. “Our past efforts rarely got sturgeon smaller than 40 inches long. Boat crews staffed by the DNR, Michigan State University and the Little Traverse Bay Band of Ottawa Indians have been netting Black Lake sturgeons for the past two weeks. The crews are using smaller-mesh nets than in the past. They are better for catching smaller ones, Borgeson said. The netted sturgeons will be marked, catalogued and released. Then comparisons will be made of marked and unmarked fish. The data will help managers better understand the age structure of the sturgeon population, he said. Natural reproduction is essentially nil, according to Baker. Any larval sturgeons born upstream on the Black River disappear quickly. Researchers theorize that they are being gobbled up by predators like rock bass, smallmouth bass, brook trout and rusty crayfish. Young sturgeons that swim in Black Lake are likely those that reared in the sturgeon hatchery that was built along the Black River in 2009, according to Baker. DNR staffers net the larva each spring as they drift downriver during the spawn. Those are then reared in the hatchery until fall when they are released as fingerlings. Borgeson said the annual “target” stocking rate of 3,250 fingerlings each year is necessary to reach a target goal of a minimum of 2,000 adult sturgeons in Black Lake. Black Lake was home to an estimated 1,600 adult sturgeons in the mid-1970s, according to DNR fisheries surveys. Their numbers declined dramatically by 1997 due to legal and illegal harvest of sturgeon. Today the fishery is highly regulated. Only six were permitted to be taken during the 2013 season. Borgeson said the marking and recapture survey now underway was also done on Burt and Mullett Lake in recent years to examine the survival rate of stocked fish, all of which were marked. “The good news was that they survived,” Borgeson said. “The bad news was we weren’t seeing any natural fish. That’s why we have gone to Black Lake, to see if we have similar survival of stocked fish. 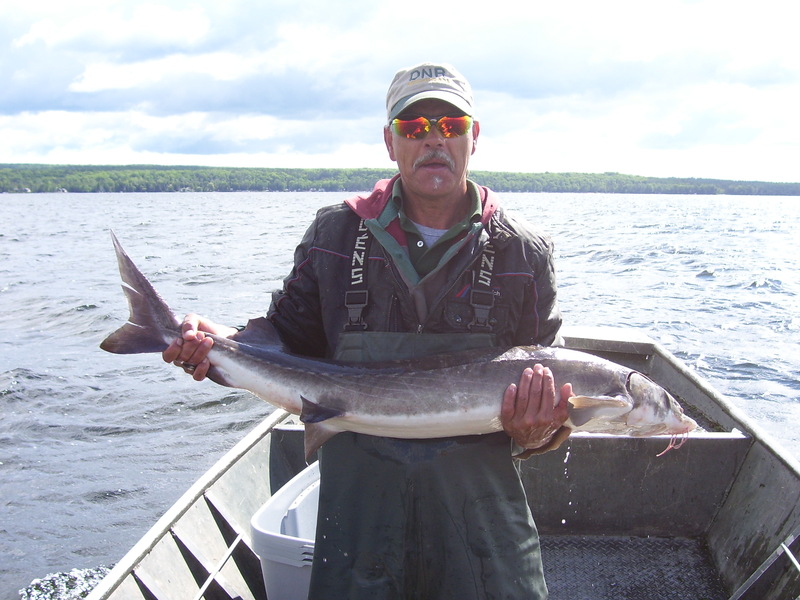 DNA testing, he said, will be done on any unmarked sturgeon to determine if they are wild. Any that is 30-inches or more are either stocked fish that lost a tag or one that is naturally reproduced. This entry was posted in Uncategorized and tagged Black Lake, Conservation, DNR, Environment, Fish, Fishing, Little Traverse Bay Band of Ottawa Indians, Michigan, Michigan Department of Natural Resources, Michigan State University, Sturgeon. Bookmark the permalink.